Meet Manel Valero and Daniel Ballis. 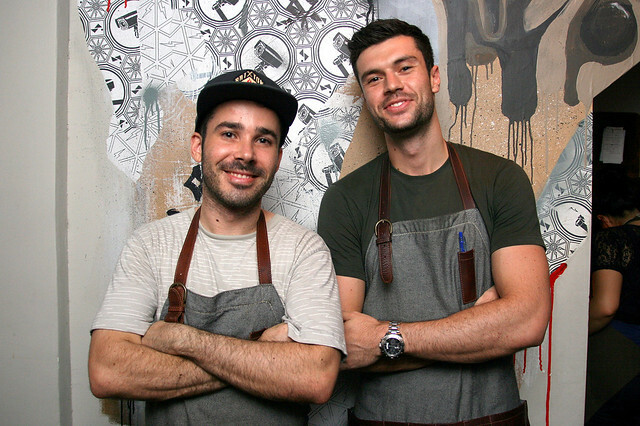 These guys are behind Moosehead, a hip livewire of a kitchen bar, serving edgy and inventive cuisine combinations. Chef Manel is from a town close to Barcelona, but found his passion for cooking in Beijing. Owner-operator Daniel with his dad Glen are avid world travellers and restauranteurs from Australia. Together they infuse Moosehead with a 'global soul' where they create tasty treats with freestyle expression. 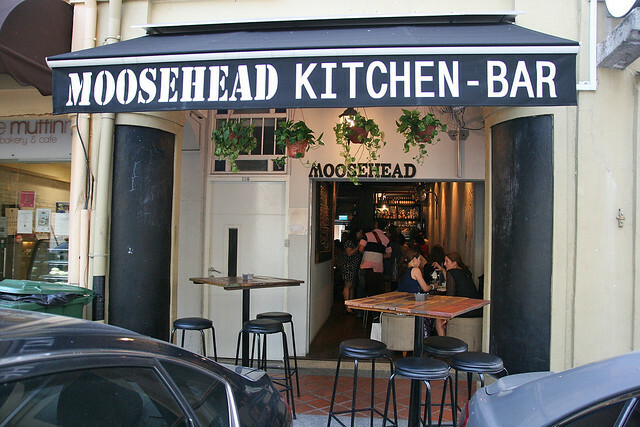 Moosehead feels cosy and edgy all at the same time. It's a narrow shoebox configuration at this corner prewar shophouse. There's lots of vintage wood grain, a bit of industrial metal, and long plaster walls in earthy browns and grays. You'll see shabby chic in repurposed items like wardrobe doors that are now giant wall mirrors, and flea market wall racks that hold wine glasses. 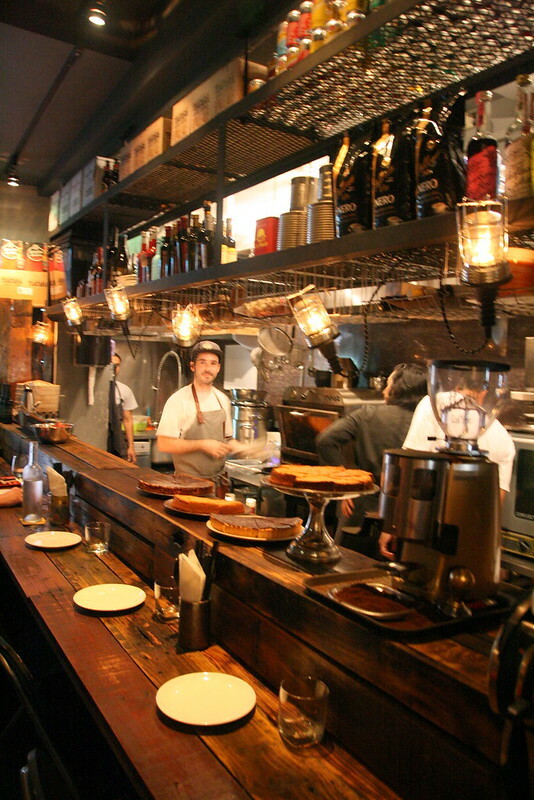 The open kitchen features an awesome charcoal grill oven, from which many smokily delicious things emerge, as you'll see. Manel had studied art and design in Barcelona before a stint with a catering company sparked his interest in cooking. He left for Beijing to work in the Spanish restaurant Migas, and then came to Singapore in 2012. Manel helped open FoodBar Dada (now defunct tapas bar), Prive Grill and helped with research at 2am:Lab, before setting up Moosehead. This chef has also been spinning as a DJ since he was 16. His keen interest in music is also why Moosehead has this indie energy in its in-house play-mix - jazz, reggae, funk, hip-hop and techno. 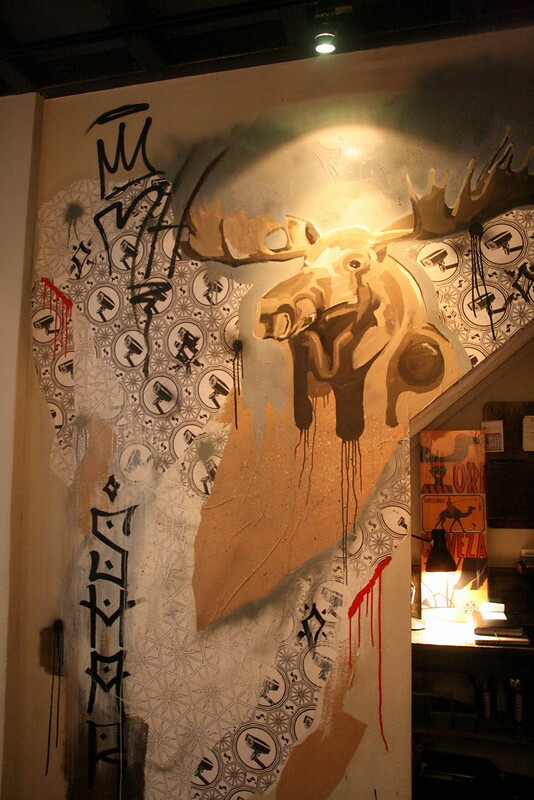 Moosehead also showcases the playful imagination of its owner-operator Daniel Ballis. Daniel himself has lived in Asia for 12 years, and went to school in Phuket, Bintan, Shanghai and Kuala Lumpur - pretty exotic for a Melbourne native. He worked at Four Seasons Hotel in Sydney before coming to Singapore. He still travels, and loves checking out new eateries, mostly for ideas and experience. 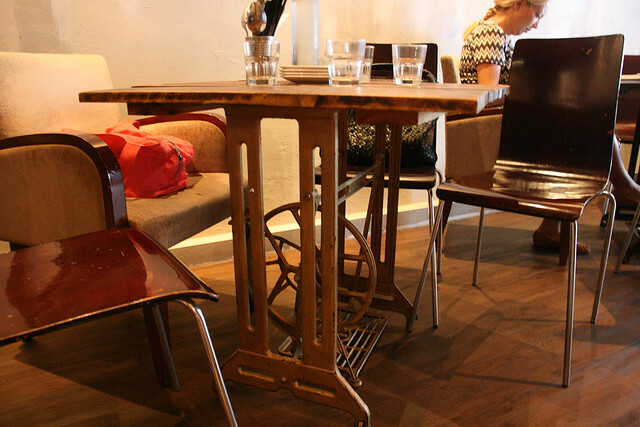 The place is peppered with eclectic furniture, some of which are unusual tabletops on cast iron sewing machine legs. Seating comes in all shapes and mismatched sizes. But it's a place where you can let your hair down, relax with friends, and tuck into the 'elevated street food' inspired by Manel's and Daniel's travels and experiences in many countries. 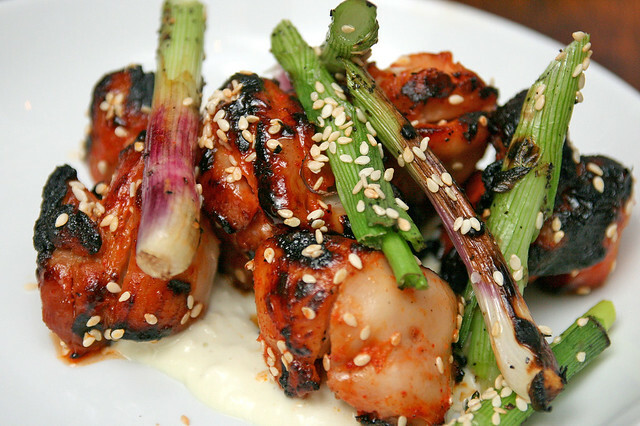 The food can best be described as modern Mediterranean spiked with Japanese and South-east Asian influences. Manel likes to combine bold flavours and textures, as is evident right from the appetisers. 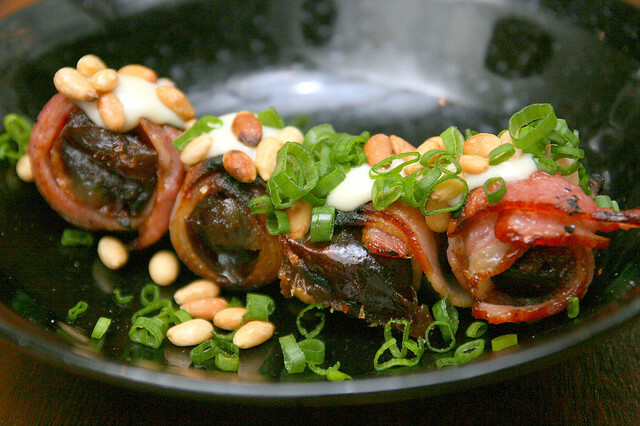 Bacon-wrapped chargrilled dates, with roast garlic aioli and pine nuts (S$8) will make the sweet toothed swoon. The grilled dates are meltingly warm and soft on your tongue, while the bacon works savoury magic all over. The dates with the chargrilled caramelisation are ultra sweet though. 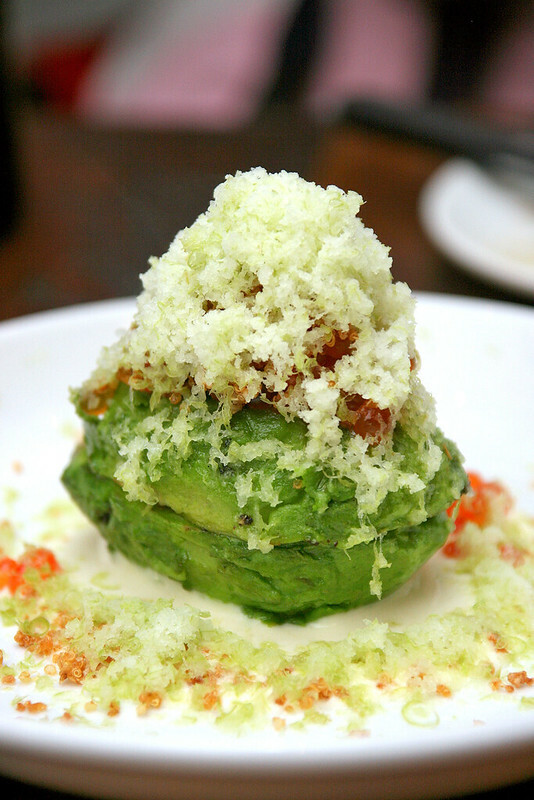 The Grilled Avocado, Ajo Blanco, Quinoa, Salmon Roe (S$18) is a stellar example of contrasting textures and rich flavours coming together. 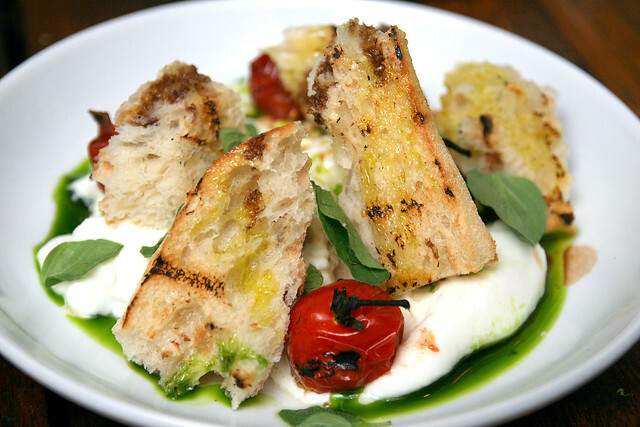 Hot and warm, crunchy and creamy, sweet and umami. The ajo blanco sauce is interesting - made of olive oil, bread, almond and garlic - and gets its creamy colour from the almonds. You get some chef action with this dish too. 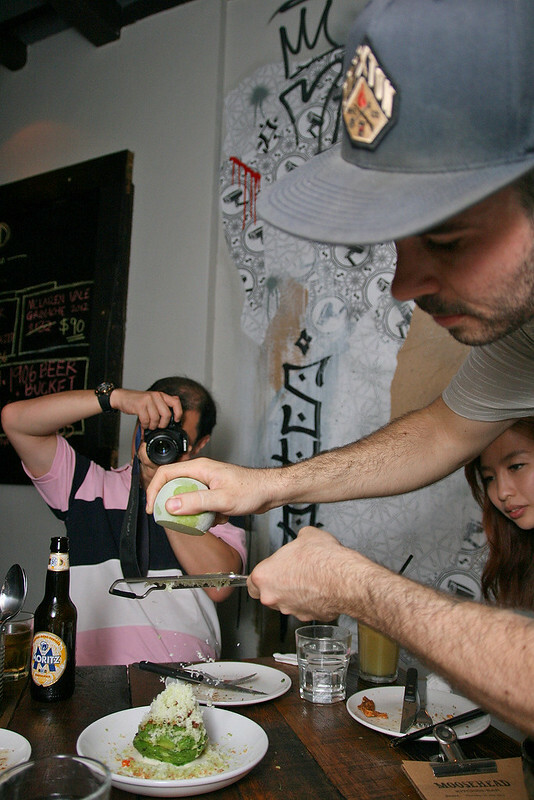 Here's Manel shaving a frozen apple over the warm grilled avocado. The effect is amazing - watch the apple practically melt all over the avocado. 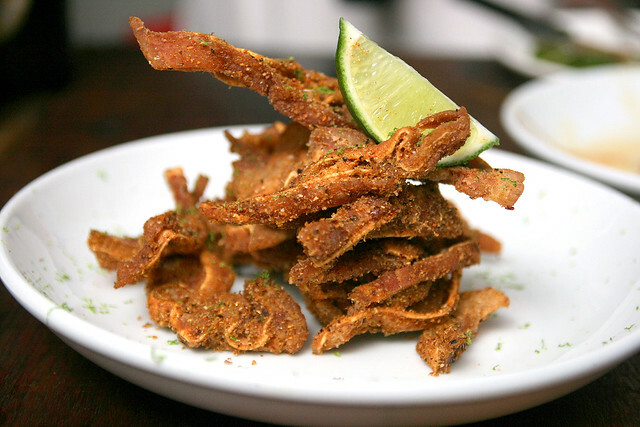 Crispy spiced pig ears (S$16) make a great beer snack. They are ultra crunchy and addictive, with the spices which seem to include cumin, coriander, paprika and pepper. Chef Manel had wanted to make deep-fried pig's face, apparently a popular street snack in Spain. But he could not get the face skin alone; only whole pig's heads were sold. So he hit on the idea of using pig's ears instead. It worked. I'm glad, cos I love pig's ears! In fact, I wrote a whole piece on pig's ears after this, for Yahoo Makanation. I was surprised at how much I liked this. What intense flavours. 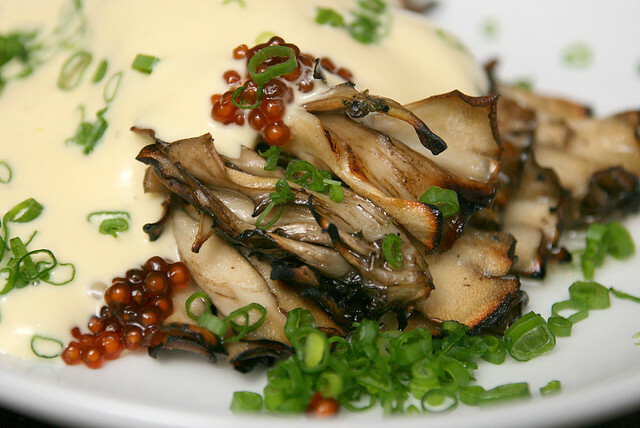 The Japanese mushrooms are beautifully grilled, and the salty soy mini tapioca pearls are especially fun to eat. This is probably the most conventional dish here - it's a staple favourite from the Mediterranean. Another winner here from the grill. 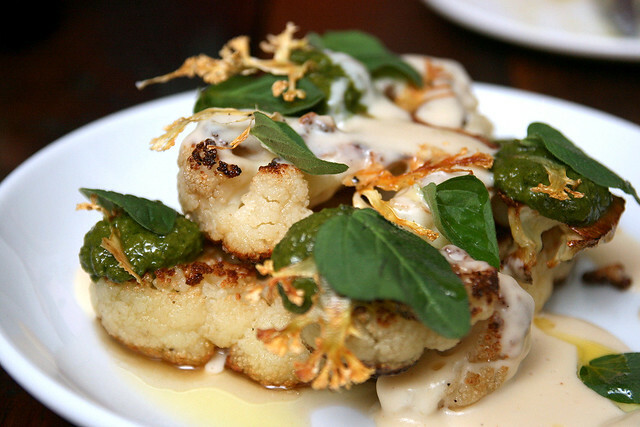 Smoky grilled cauliflower drizzled with a creamy sauce and more sparingly a green sauce that's potently umami - I know the secret ingredient, but will let you try and guess what it is. 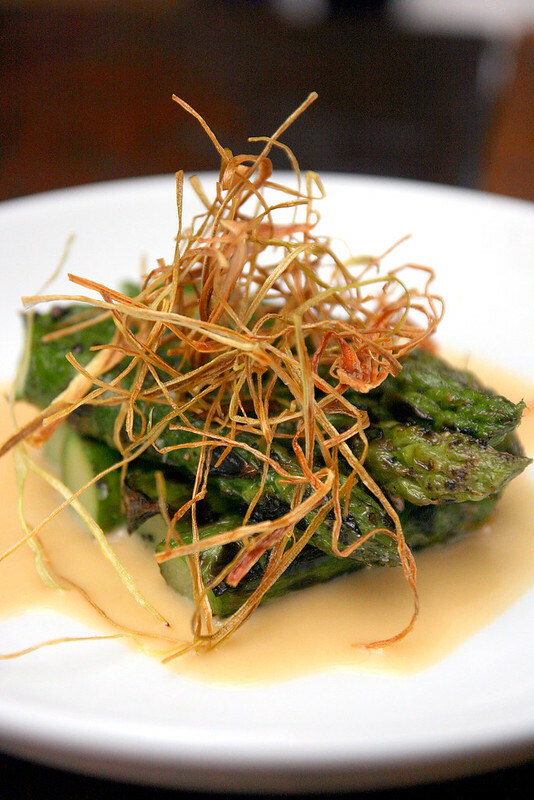 The simplicity of this dish works, although the leek shreds are a little hard to chew. This is also vegetarian, by the looks of it. That grill works wonders with vegetables as much as it does with meat. Speaking of meat, let's move on to the mains. 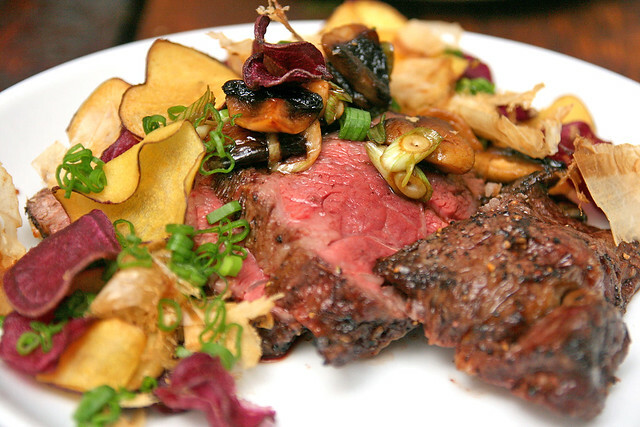 Moosehead gets its wagyu from the Stockyard farm in Australia. The beef is not too fatty but is unusually gamey for wagyu. The medley of mushrooms and root chips add fun and texture. 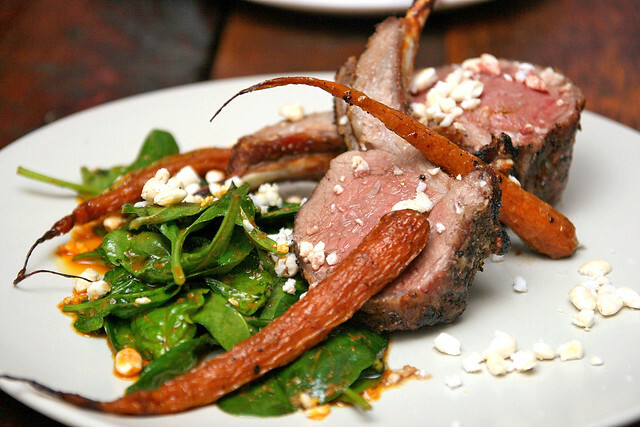 The spice-crusted lamb pairs very well with the curry dressing in the spinach here. Sweet carrots round up this hearty and aromatic main dish. From time to time, they have special creations, as Manel comes up with new ideas. 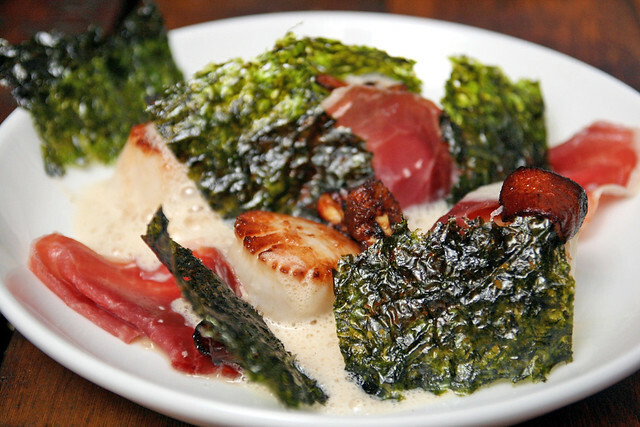 This nice ensemble features plump scallops from Boston, Iberico ham and crispy seaweed that I just feel like wrapping around the scallops and soaking them in the porcini puree. Chef Manel also brought out an experimental chicken bulgogi, with sesame seeds and horseradish mayo. I liked the seasoning and the chargrill aspect, but mayo is a little too rich and overpowering. Maybe a lighter citrusy dressing would balance the sweet and spicy marinade? Or maybe I'm getting too old for greasy food. 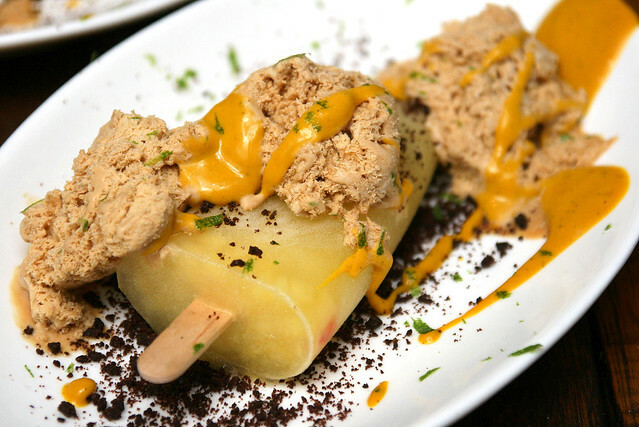 A seriously refreshing Chili Pineapple ice pop with Gula Melaka frozen foam, banana custard and chocolate soil. We're advised to eat all the elements together, but I kinda enjoyed them individually as well. Chili pineapple ice pops are popular in Mexico. Manel took this to a whole new level, incorporating local ingredients like gula melaka. 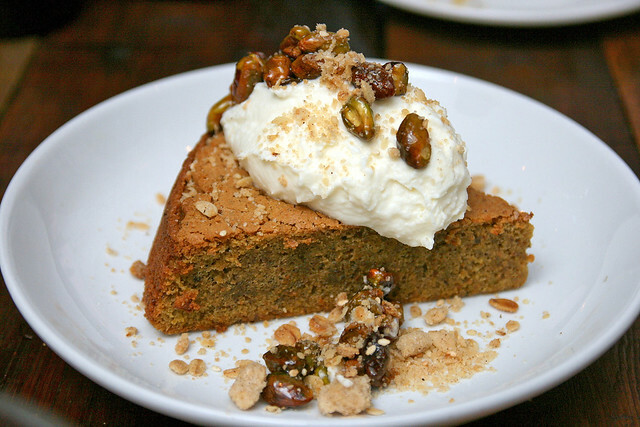 Also by popular demand is the pistachio cake, but it does pale in comparison to the fun experiment that is the chili pineapple ensemble. This is a pretty dense cake, and can be a tad dry, so take it with lots of the fresh cream. Moosehead is certainly a great place for dinner and drinks, but for lunch, you can get a good Reuben sandwich or some items from the dinner menu (about 70% of it might be available). Go with friends so you can try more plates. Eat + drink + share, as their motto goes!